LACC’s Society, Politics, and International Relations in Argentina study abroad program is an intensive four-week program designed to foster an understanding of Latin American international relations through the experience of living and studying in one of the most vibrant cosmopolitan cities in the Americas. Open to both undergraduate and graduate students, the program takes an interdisciplinary approach to the study of the region. Students register for two courses, International Relations of Latin America and History, Politics, Society and Culture of Argentina, for a total of 6 credits. Course requirements for undergraduate and graduate students vary accordingly. All classes are held in Buenos Aires. In addition to classroom instruction, students participate in field trips to various locations of cultural and/or historical importance throughout Buenos Aires. Additionally, a 2-day/1-night excursion to Iguazu National Park exposes students to the diversity of the country and current issues in the region through direct contact and dialogue with cultural, social and political actors in the country. Known as one of the world’s most beautiful cities and with a population of nearly 12 million inhabitants, Buenos Aires is a cosmopolitan, diverse and exciting destination. 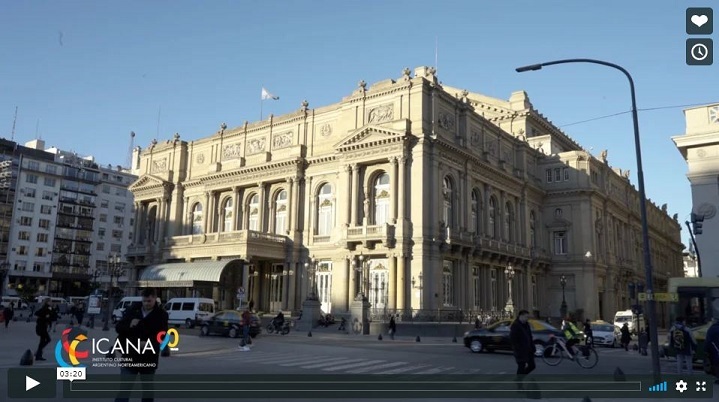 Students may explore the city’s rich cultural life through the varied neighborhoods, including the famed Europeanesque Recoleta, the theater district of Corrientes, the bustling Microcentro, trend-setting Palermo, historic San Telmo, and the immigrant enclaves of Once and La Boca, among others. Despite its size, the city is very accessible, pedestrian-friendly and generally safe. The months of June and July coincide with Argentina’s autumn; days are typically bright and crisp and the evenings are cool. While in Buenos Aires, students live with Argentine families in the neighborhoods of La Recoleta, Palermo and Barrio Norte. Through their host families, students may experience Buenos Aires as a local, while benefiting from the opportunity to immerse themselves in Argentine culture and speak Spanish daily. The cost of the program is $4,701. 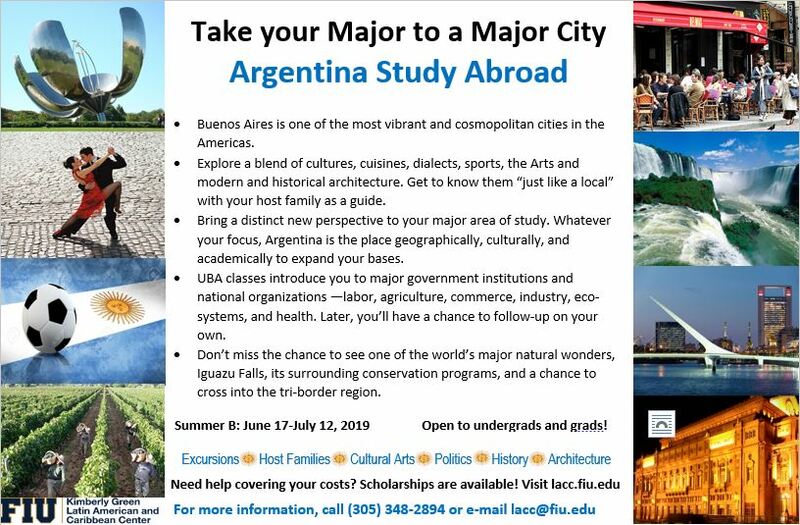 The program cost includes: daily classes and all course materials, homestay with an Argentine family and two meals per day, welcome lunch, bus tour of Buenos Aires and guided site-visits to points of interest throughout the city, two tango classes, one 2-day/1-night excursion to Iguazu National Park, and pre-departure and in-country orientation sessions. In addition, students must cover the cost of the non-refundable Study Abroad Fee ($175), tuition (6 credits), airfare, local transportation and one meal per day. Program deposit (non-refundable) - $300.00 due on or before May 6, 2019 (made payable to FIU by bank check or money order, credit cards are also accepted). Submit deposit to Kimberly Green Latin American and Caribbean Center, 11200 S.W. 8th St, DM 353, Miami, Florida 33199. Please contact Viroselie Caviedes (vcaviede@fiu.edu) for information on credit card payment option. More than 45 days prior to departure: Full refund less the non-refundable deposit in the amount of $300. 21 days prior to departure: Full refund less 50% of the program fee and the non-refundable deposit in the amount of $2000. Less than 21 days prior to departure: No refund. Once the program has begun, there will be no refund made for any portion of the program that the participant declines, or for any unused services following withdrawal from the program. For cancellation policy of FIU tuition and fees, please click here. Participants concerned about the level of physical activity should contact the faculty director of the program. Non-FIU students must apply to FIU as a Non-Degree seeking student as well. All applicants are encouraged to submit the application packet, along with the required supporting materials to the Kimberly Green Latin American and Caribbean Center by 5:00 pm on May 3, 2019. The Argentina Study Abroad entirely fulfills the Capstone requirement, which is 1 of the 5 requirements for the Global Learning Medallion award.